So, what is all the hoopla about a high-protein dog diet and when is this writer finally going to slip in that “t” word she thought important enough to include in the blog title? 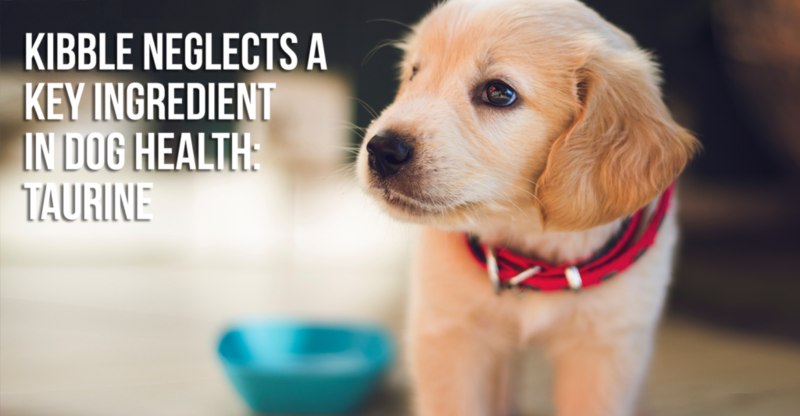 Dog health depends largely on getting the proper nutrients from their food. Simply put, meat-based proteins are natural amino acid supplements and a diet rich in amino acids is great. Taurine is an amino acid. (Think the building blocks of protein and our muscles.) This amino sulfonic acid is especially concentrated in the heart muscle aiding in cardiac function. If that weren’t enough, this superstar helps eye health, immune system function and in the function of multiple other systems. With taurine, all things are possible (including proper heart function). How does this relate to the grain-free craze then? AAFCO, the Association of American Feed Control Officials, mandates what is required in dog foods (not what isn’t allowed, which is a story for another time). 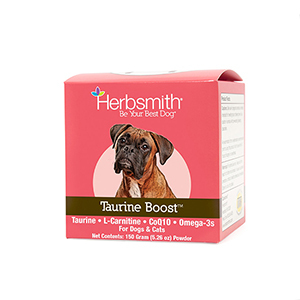 Assuming that dogs can develop taurine in their bodies with the help of other sulfonic acids (cysteine and methionine), these acids are included as a requirement. Some dogs can develop taurine by making it, that is true, but some can’t and that’s why including it in their diet becomes so important. It’s also important to know about taurine because there is a correlation between low blood taurine and Dilated Cardiomyopathy. So what’s the big hoopla about a high protein dog diet and when is this writer finally going to slip in the “t” word she thought important enough to include in the blog title. Dog health depends largely on getting the proper nutrients from their food. Simply put, meat-based proteins are natural amino acid supplements and a diet rich in amino acids is great. Taurine is an amino acid. (Think the building blocks of protein and our muscles.) This amino sulfonic acid is especially concentrated in the heart muscle aiding in cardiac function. If that weren’t enough, this superstar helps eye health, immune system function, and in the function of multiple other systems. With taurine, all things are possible (including proper heart function). So, how does this relate to the grain-free craze. AAFCO, the Association of American Feed Control Officials, mandates what is required in dog foods (not what isn’t allowed, which is a whole other story). Presuming that dogs can develop taurine in their bodies with the help of other sulfonic acids (cysteine and methionine), these acids are included as a requirement. Some dogs can develop taurine by making it, that is true, but some can’t and that’s why including it in their diet becomes so important. The heart is a muscle that circulates blood throughout the body. A heart deficient of taurine becomes weaker and pumps less efficiently. This happens because as the heart weakens it begins to dilate. Dilation means that the chamber of the heart becomes bigger which increases the amount of blood in the heart. The weakened heart muscle can’t push the blood through the system the way it should. Dogs with DCM will become fatigued, have less energy and breathe heavier with exercise. This chronic disease could lead to heart murmurs, arrhythmia, and a backup of fluids in the lungs. It is more common in mid to older dogs because the deficiency takes time to affect the organs, generally two to three years. It’s also seen in larger breeds, 40-50 pounds and up. This is likely due to long-term marginal nutrition creating a bigger deficit in taurine levels. While DCM can be fatal it depends largely on the severity of the disease. Once taurine is added to diets, symptoms can dissipate in as little as a month. It should be noted that not all DCM is due to low taurine levels but it can be the cause. If your pet is showing any of the symptoms mentioned earlier, please contact your veterinarian to set up an appointment immediately. Does your dog’s kibble make the grade? Knowing that taurine is paramount to your pet’s health and that a high meat-based protein diet is necessary to get taurine, it’s important to know whether your kibble makes the cut. The first thing to do is study your pet food’s ingredient deck. Ingredients are listed from the highest component to the lowest, the first ten ingredients generally being what the food is comprised of most. It’s important to note that even if meat is the first ingredient, there’s still nine other ingredients that could be plant-based. 1/10 meat ingredients mean a low taurine formula. Also, if you find for instance, lamb meal, red flags should fly. “Meal” is a rendered product of poor quality meats. The meal has to be extruded, meaning heavily heated, to sterilize the meat which also cooks most of the nutrients out of the food. Research regarding lamb meal and rice formulas were almost entirely devoid of taurine. Next to that ingredient deck you’ll find nutrition facts or what some pet food brands call “guaranteed analysis”. 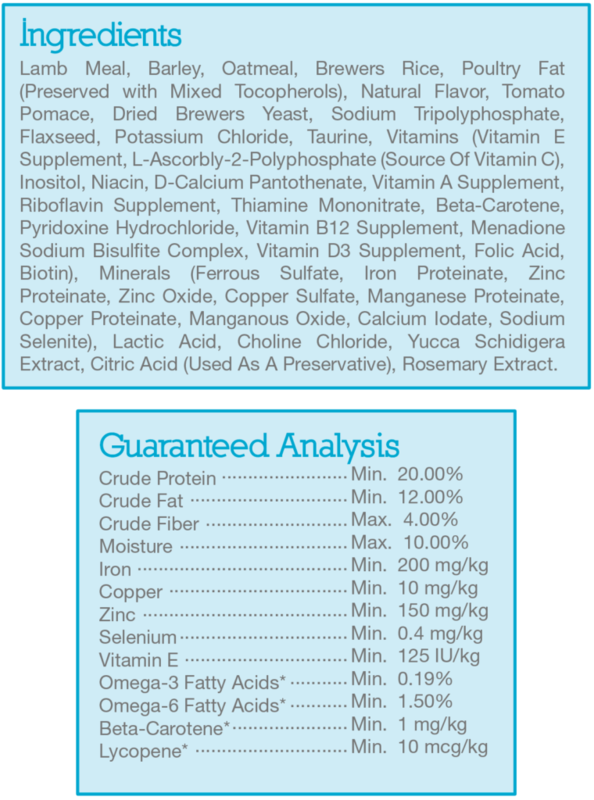 Unfortunately, pet food brands are only required to say it contains a certain percentage of protein. It does not need to specify whether that protein comes from plants or meats. Proteins can come from plants but plant-based proteins just don’t provide the level of taurine needed, meat-based proteins do. If you’re still not entirely sure, call the manufacturer. Ask what level of taurine can be found in their food. Don’t hesitate to ask about the percentage of meat protein in their formulas either. Here’s how to boost taurine levels in your dog’s diet. Add high-quality fresh meats or organs to their diets. Chicken, turkey, duck, and beef are all great options. Freeze-dried, dry-roasted or air-dried meats are also an option if you’d prefer to stay away from raw foods. All of these options avoid high heat that destroys taurine. Add a taurine supplement to their diet. This can also help support immunity, brain health, and eye health (yay!). On a budget? If kibble is your choice because of affordability, consider adding meats to their diet when you can. Waiting for a sale and stocking up is a great option. Anything you can do can make a difference for your pet. Looking for a healthy dog food option to up your pup’s food game? Consider Dr. Bessent’s new food – The Simple Food Project. Each recipe contains real, whole food ingredients with organ meat in every recipe! Remember, taurine is at the heart of it all. Im already in balance with all my Pmegas?Will this disrupt that balance ? A dog seldom gets too many Omega-3 fatty acids and if he does, the Omega 3s are utilized by his body as energy. So, offering your dog several omega sources is actually great!